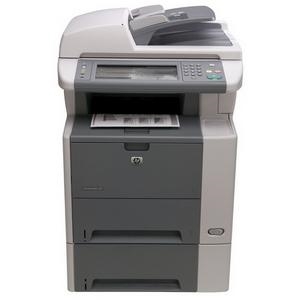 The HP LaserJet M3027x increases productivity while preserving your budget with the key functions your workteam needs in a simple and reliable package. You'll see positive results with consolidated printing, copying and faxing functionality in one compact device that can fit into just about any space you require. This multifunction printer delivers print and copy speeds up to 27 pages per minute and a first page out time of less than 10 seconds. Expect consistency with HP cartridges that are carefully designed with HP Smart Printing technology, to automatically optimize print quality and consistency throughout cartridge life. Complex jobs are no longer a chore with a 400 MHz processor and 256 MB of standard memory (also expandable to 512 MB). The HP LaserJet M3027 MFP series uses industry-standard HP PCL5 and HP PCL6 to reliably process and deliver your most complex documents. HP postscript level 3 emulation adds the flexibility you need to print image-heavy jobs.